Thank you for all who supported and came along today. A very successful Swap or Mend. A cold and wet day but our regulars came along and many new people as well. After today (we have more volunteers) we can now offer mending needing stitching, leather work, simple electrics, welding, any metal, wood or stone products and possibly electronic goods. Not everything can be mended but many items can. Before throwing an item away, bring it to Swap or Mend we may be able to mend it. Lets keep things out of landfill! We are having a break over Christmas and New Year our next Swap or Mend is on Saturday 6th February. 9.30 to 1 pm. Unitarian Meeting House (next to library ) in Framlingham. Collect together those items you don’t want and bring them along to swap. Our next Swap or Mend is this Saturday, 21 st November. 9.30 am – 1 pm. 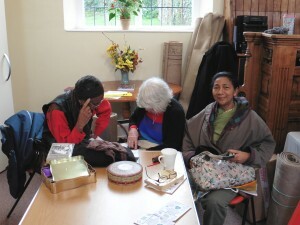 The Swap or mend takes place in the Unitarian Meeting House, next to the library, in Framlingham. Bring your unwanted items to swap and bring those broken items for mending. If you really haven’t got anything to swap then just come along and take what you want free or give a donation. All donations go to Greener Fram funds which pay for the hire of the hall and funding other projects. The community garden group invites you to join the working party this Sunday. (15th November) All are welcome. Come and learn new skills or share those you have. Refreshments available. 10 am to 12 noon.